Address: 363 West 16th St. The celebrated meatpacking district hotel takes the nautical theme to the next level with its 126 cabin-inspired sleep spaces ($295 and up through Sep 5, when they’ll go for $425). 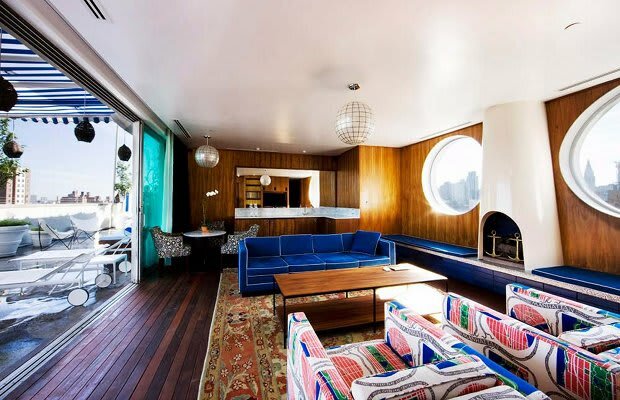 Though you may be looking out at the Ninth Avenue hustle from your room’s windows, their large porthole design might have you convinced you’ve shipped out to sea. However, what you won’t find on your typical corny cruise line are award-winning sushi, like that of Matsuri, or parties and performances like those of the pulsing Hiro Ballroom—both located just an elevator ride downstairs. Complimentary bikes, Bigelow bathroom products, and outdoor showers (yours for the milking, provided you opt for one of the space’s Penthouse Suites, which feature private garden terraces) also make for one hell of a fantastic voyage.